Red leather dog collar with heart shaped pink & white cat eye cabochons. All our products are 100% handcrafted starting from construction of the leather product to the intricate gemstone design work. We also custom cut each piece of gemstone to fit our unique designs. Lately a detail inspection is made on each product before it leaves our facility to ensure the highest quality standards are made. We believe our pets deserve the very best so we only use genuine leather, gemstones, and brass or brass finished hardware on our products. Our products are tested to be nickel and lead safe. The lacquer used in the finishing touches is non-toxic and water resistant.We design each of our products with fashionable pet owners in mind. 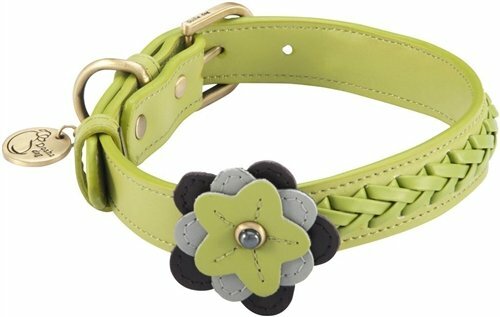 We incorporate inspirations from fashion trends and create a line of fine leather pet accessories that can be worn in all occasions. Available Colors in Red, Dark Pink Available Size in two widths: Width A: 3/4" - Small: 10.5" - 12", Medium: 12" - 14" Width B: 1" - Large: 14" - 17", Extra Large: 17" - 20"
Blue Sand Stone & Sodalite Imperial Dog Collars are made with genuine leather embellished with gemstones. We custom cut each piece of gemstone to fit our unique designs. Designed with the fashionable pet owners in mind, our collars incorporate inspirations from fashion trends that can be worn in any occasion. 4' companion leash sold separately. Available size in Extra Large: 1" wide x 17"-20" neck. 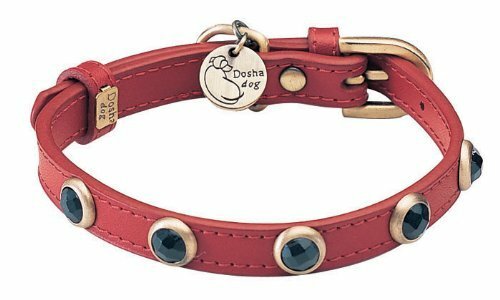 This Dosha Dog American Dog collar in red is made with genuine leather and brass hardware. The Large American collar features 3 stone cabochons and 2 brass stars. 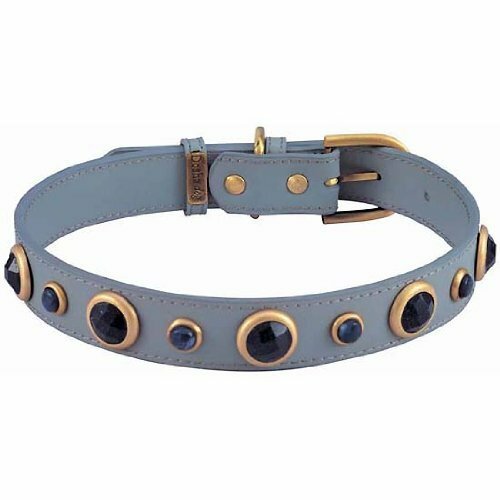 This Dosha Dog American Dog collar in blue is made with genuine leather and brass hardware. The Medium American collar features 5 stone cabochons and 4 brass stars. 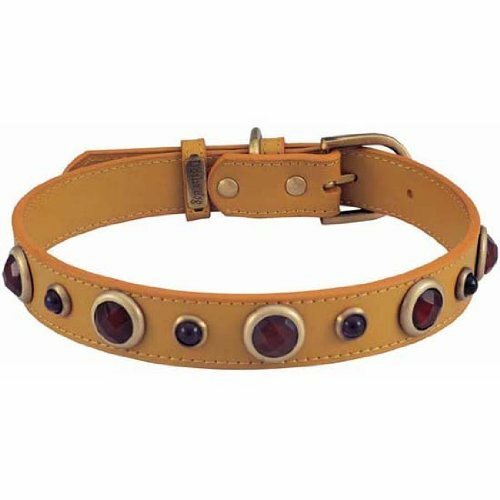 Carnelian Imperial Dog Collars are made with genuine leather embellished with gemstones. We custom cut each piece of gemstone to fit our unique designs. Designed with the fashionable pet owners in mind, our collars incorporate inspirations from fashion trends that can be worn in any occasion. 4' companion leash sold separately. Available size in Large: 1" wide x 14"-17" neck. 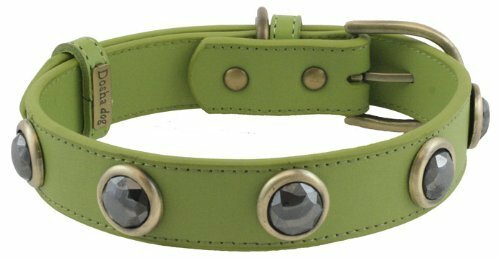 Onyx Pebbie Dog Collars are made with genuine leather embellished with gemstones. We custom cut each piece of gemstone to fit our unique designs. Designed with the fashionable pet owners in mind, our collars incorporate inspirations from fashion trends that can be worn in any occasion. 4' companion leash sold separately. Available size in XXS: 1/2" wide x 7"-8.5" neck. This Dosha Dog American Dog collar in white is made with genuine leather and brass hardware. 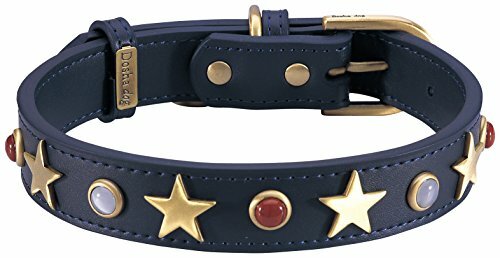 The Extra Large American collar features 3 stone cabochons and 2 brass stars. This Dosha Dog Brown Butterfly Collar is hand-crafted with genuine leather and brass hardware. 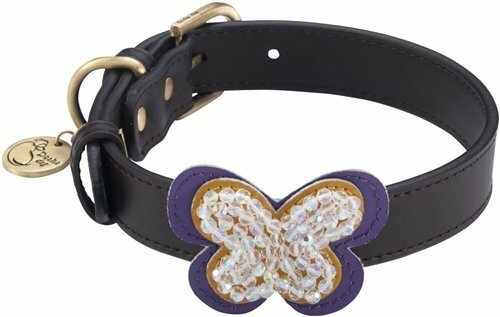 The purple and yellow leather butterfly motif is embellished with fasceted crystal beading which measures 1.5" tall and 2" wide, and is secured onto the collar with a brass rivet. 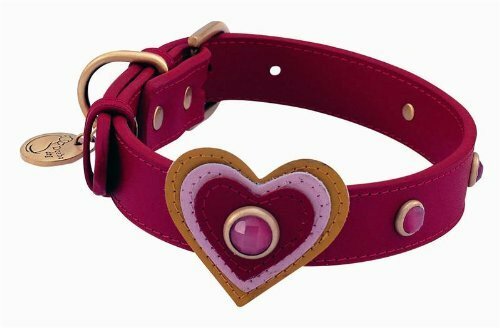 Pink Cat Eye Heart Dog Collars are made with genuine leather embellished with gemstones. We custom cut each piece of gemstone to fit our unique designs. Designed with the fashionable pet owners in mind, our collars incorporate inspirations from fashion trends that can be worn in any occasion. 4' companion leash sold separately. Available size in Extra Small: 5/8" wide x 8.5"-10" neck. 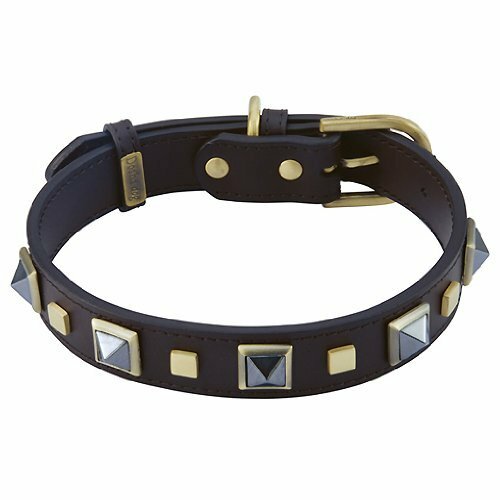 Faceted Hematite Dog Collars are made with genuine leather embellished with gemstones. We custom cut each piece of gemstone to fit our unique designs. Designed with the fashionable pet owners in mind, our collars incorporate inspirations from fashion trends that can be worn in any occasion. 4' companion leash sold separately. Available size in Extra Large: 1" wide x 17"-20" neck.